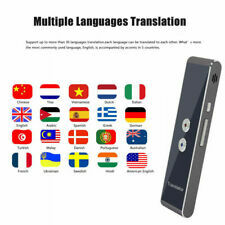 Electronic Handheld Multi-language 6 language Translator English Spanish French. It instantly translates 5,000 words and 120 common sentences in each of six languages: English, Spanish, French, German, Italian & Dutch. Multiple Languages Translation: Support up to 37 languages translation, each language can be translated to each other. WIFI wireless connection: supports WIFI to connect to the Internet at high speed, making the translation more convenient and accurate. Clear sound quality, no noise, and easy to carry, a perfect assistant of language translation. (5) After choosing the translated language, press the button A on the translation stick to start the recording, release the button after the speech is finished, and check the translation results on APP for about 1 second, the translator recognizes the speech as a text, then translates it into foreign language and plays. CPU: MT6572. Flash: 512MB 4GB. WiFi only: 2.4G, 802.11b/g/n, No SIM. Speaker: 2535(BOX), 2W power amplifier. Microphone: Double MIC, Anti-interference. USB: 5 pin Micro USB. Bluetooth: Yes. The translation context shows phone screen, and the translation voice transmit to the earpiece(phone&internet ). Supports Languages Translation: Chinese, English, Japanese, Korean, Russian, French, Thai, German, Italian, Arabic, Spanish, Danish, Swedish, Finnish, Dutch, Portuguese. 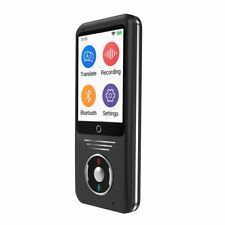 Smart Language Translator Device, Electronic Translator Portable Bluetooth. Multi-Language Translation, 16 Languages Wireless Translator Headset. This is not only a simple Bluetooth wireless earphone, but also a useful multi-language translator. Unlike text translators that require one to stop and enter each sentence word for word, one simply talks into this device as if engaging in real conversation. It verbally translates 12 languages without requiring Internet access including Chinese, French, German, Italian, Japanese, Korean, Russian, and Spanish. Translator Highlights -Over 50,000 English and Spanish words. The item you are viewing is in new condition and has never been used. -Built in calculator, clock, and phone area code database. Speech Translation---Just press the "A" button and start talking, then release the button it will automatically translate your speech into "B" language. On the contrary, press "B" button, it will translate your speech into "A" language.Text Translation: You can type the contents you want to translate by keyboard and translate it into another language. Bluetooth wireless connection, connect to your phone via Bluetooth, allows wireless transmission distance up to 8m. Bluetooth: 4.2. Wireless distance: within 8m. Clear sound quality, no noise, a perfect assistant of language translation. Delicacy Smart Voice Simultaneous Translator. 1xInstant voice language translator. √Touch screen to shows voice to text and your translation text. Simplified Chinese, English (US), English (English), Japanese, Korean. 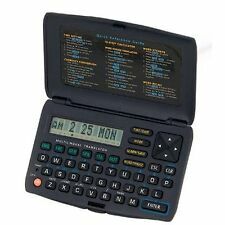 Franklin Spanish English TES-121 Phrasebook Travel Translator TES121 Works! 5 out of 5 stars - Franklin Spanish English TES-121 Phrasebook Travel Translator TES121 Works! 1 product rating1 product ratings - Franklin Spanish English TES-121 Phrasebook Travel Translator TES121 Works! 1 x Translator. -Instant translation,you don't have to wait. Kitchen, Dining & Bar. -Supports more than 33 languages,high accuracy. Language recognition distance: 1m. Wirelesss Distance:10M. -It is a great assistance for you when you have a social chatting,travel overseas,and work with international partners. Battery 2000mAh, Mic. Built in Dual. Speakers: Built in Boosted. you will receive what you see in picture only. ROM 8GB Ram 1 GB, Wireless: Bluetooth. Spanish English Pocket Translator Radio Shack 63-932 Vintage plus Converts more! The box has blemish on the back, but otherwise looks new, Manual is also included in box. Easy to use - just enter the word or phrase in English or Spanish and press a button to translate it into the other language. 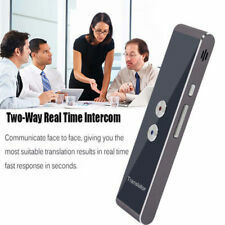 Smart Voice Translator Portable Two-Way Real Time Multi-Language Translation USA. Condition is New. Shipped with USPS Priority Mail. Intelligent Voice Translator Simultaneous translator Handheld Deluxe Translator . Condition is New. Shipped with USPS First Class Package. 1 Translator. The device must work with the app. Note: Wait for 2s after you press the button "A" to start talking, otherwise the device maybe not ready yet. Text Translation: You can type the contents you want to translate by keyboard and translate it into another language. 50 Language Roo Instant Two-Way Voice Translator 2019. High sensitivity and fidelity: Push the button on the device and hold it until you finish your speech. The translator will recognize what you said and speak out the translated result. 2-Way Voice Translator: Source language and Target language both can change to another languages, all have 86 languages. For example, we can choose English⇔German, Korean⇔Spanish or Chinese⇔Engish. What’s Included In The Box: One (1) Navy Blue Quicktionary Pen Scanner. Identification: Serial Number 910181449. Model TS3.1. Pen OS 3.14 Quicktionary 2.9. ONLY English (Not in Hebrew, Russian or French). Ectaco Partner B-3 Travel Multy Phrasebook ~ English To Spanish.with stylus and SD card. works great Batteries not included =. OR YOUR MONEY BACK. CHECK OUT ALL PHOTO'S. Greetings. Up for bid is this used in good condition Casio Ex-word XD-R910 English Japanese Dictionary Silver Case. Some surface scratches and some corrosion in the coil inside battery compartment but still works great. This is powered by one AAA- battery (not included). Please view all pictures before purchasing and don’t hesitate to email me any questions. Thank you. 1 x Translator. -Instant translation,you don't have to wait. -It is a great assistance for you when you have a social chatting,travel overseas,and work with international partners. Language recognition distance: 1m. Franklin Spanish English translator TES-118A New Sealed. Condition is New. Shipped with USPS First Class Package. NOTE: There is no Bluetooth feature. Im not sure why eBay has this in the listing but i cant edit the item details. Trending at $37.33eBay determines this price through a machine learned model of the product's sale prices within the last 90 days. Used handheld portable electronic language translator made by ECTACO # TL-6. Translator TL-6 unit. Language selection screen shows the unit Translates 8 (eight) different languages to English 8 Language SD Card. Used Fanfare E3200 Multi Lingual Pocket Translator English French German Spanish Italian. This needs 4 AAA. Tested - Works. - Includes case cover. Instant-Dict GD3600 English to Chinese Two Way Translator. excellent condition.come with cover,earphone,user’s manual. not including battery. We've been an Ectaco Authorized Dealer since 1998. Among the many cool features of the Ectaco 900 Pro are You talk, it translates. The 900 Pro can translate anything you say or see. Universal Translator - a 183 language word translator.